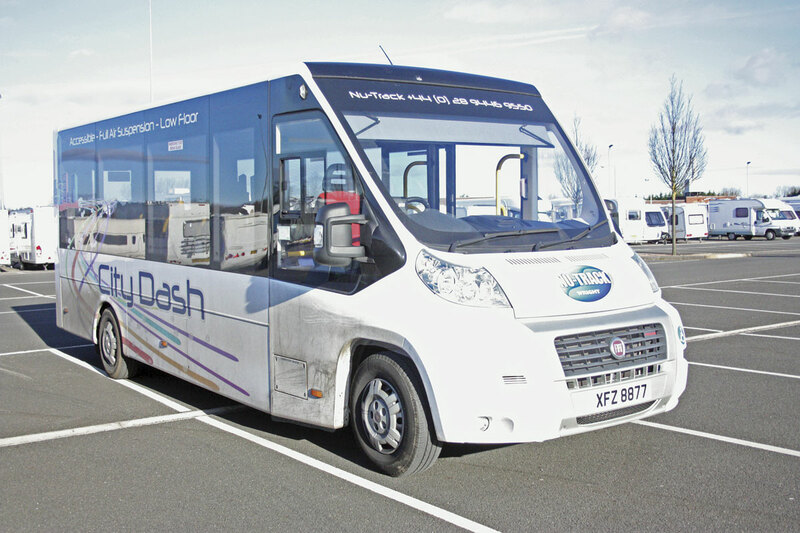 Nu-Track the Northern Ireland accessible vehicle builders, which these days is linked to the Wright Group, has thrown its hat into the ring in the field of directly wheelchair accessible minibuses with the introduction of the City Dash. To clarify, I am talking about those manufacturers that build vehicles with a completely flat saloon floor not those that have a flat section at the front of the saloon and then a step up over the rear axle and a raised seating area. 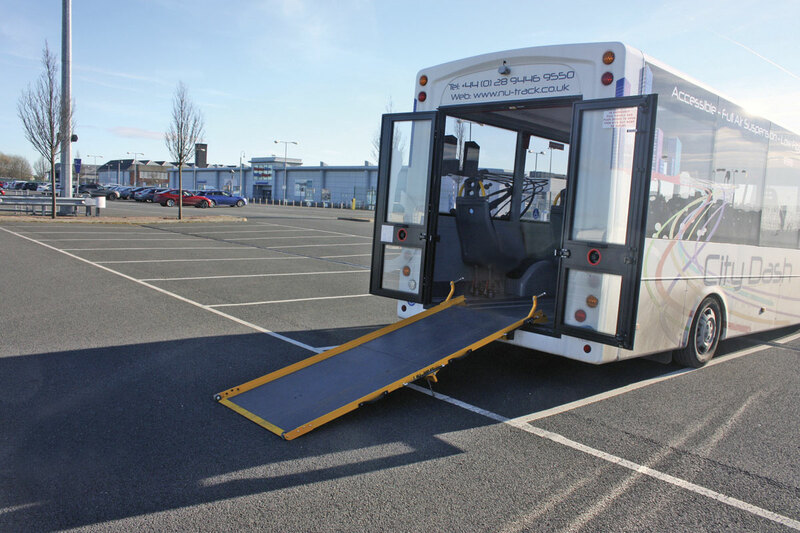 It is a growing sector of the market as many operators look for dual purpose vehicles that can cover a range of work from transporting wheelchair bound and disabled passengers to stage carriage feeder services. These vehicles are relatively cheap to buy and economical to run especially on fuel and have that direct wheelchair accessibility without the need to use passenger lifts that many are seeking. In recent times this sector of the market has been the almost exclusive territory of Mellor Coachcraft with its re-engineered Orion which was originally developed by the Bluebird Vehicles. At first glance there are marked similarities between the City Dash and the Orion but there are also major differences under the skin. 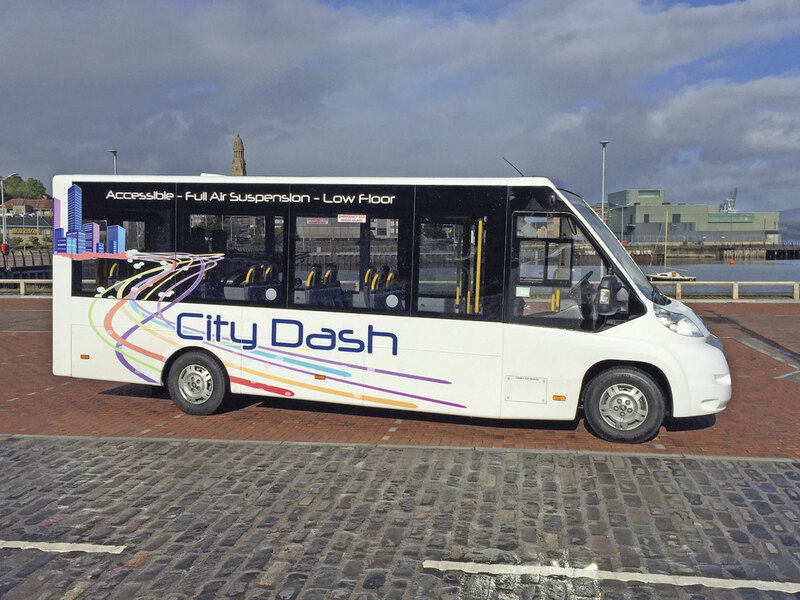 The City Dash utilises the familiar Fiat Ducato Maxi front wheel drive front end which is married to the AL-KO low-line chassis fitted with VB air suspension. The same suspension is also fitted to the front end unit. The fitment of the air suspension is key to the City Dash being able to achieve its very low entry access height of just 250mm. The Orion uses a purpose built chassis with trailing link suspension with either air or steel suspension. The vehicle has an unladen weight of 3.25 tonnes with 2.1 tonnes on the front axle and 2.4 tonnes (2.5 tonnes on future models) on the rear axle giving a gross weight of 4.5 tonnes (4.6 tonnes on future models). 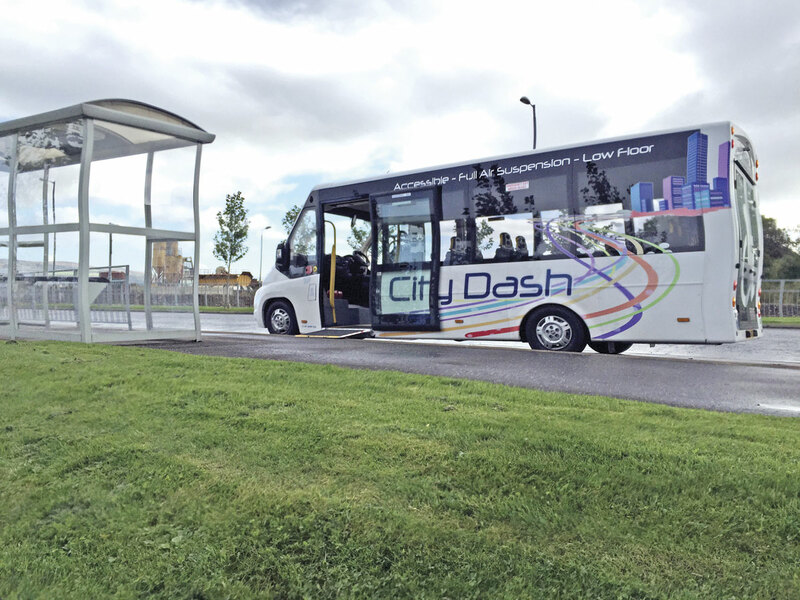 The demonstrator Nu-Track City Dash is 7.50m long, 2.26m wide and 2.8m high. It has a 4.60m wheelbase. The power unit is the 3.0litre four cylinder Multijet 180, direct injection, common rail, turbocharged diesel engine to Euro6 developing 177bhp(130kW) at 3,500 rpm and with an impressive maximum torque figure of 400Nm available across a wide speed range. The vehicle can also be specified with the 2.3 litre version of the engine that develops 130bhp. The engine is matched to a six speed automated ComfortMatic transmission probably better known by the name used for this box when it was fitted to the Iveco Daily, the Agile. The box is actually produced for Fiat by ZF. Alternatively the vehicle can be fitted with a ZF six speed synchromesh manual gearbox. Interestingly Nu-Track are also offering the vehicle using a Peugeot Boxer front end. The Peugeot is only available with manual transmission. The body, as with many of Nu-Track products, is manufactured of aluminium alloy box sections and the whole structure meets all the current structural regulations for this class of vehicle. The structure is packed with thermal and acoustic material. Cladding uses GRP mouldings except for the lower side panels which are of aluminium alloy. Again as with all Nu-Track products these are fitted with quick release fittings enabling damaged panels to be replaced very quickly. The wide front entrance, 960mm, is fitted with a Tamware fully electric, quick acting, plug door. 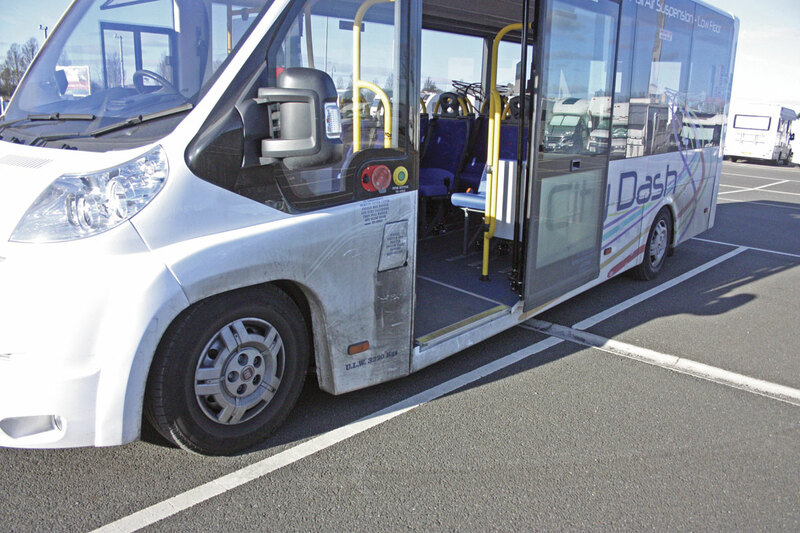 There is a fold out ramp at the front entrance but stopping the vehicle against pavements avoids the need to use the ramp because of the low entrance height that can be achieved by lowering the suspension. 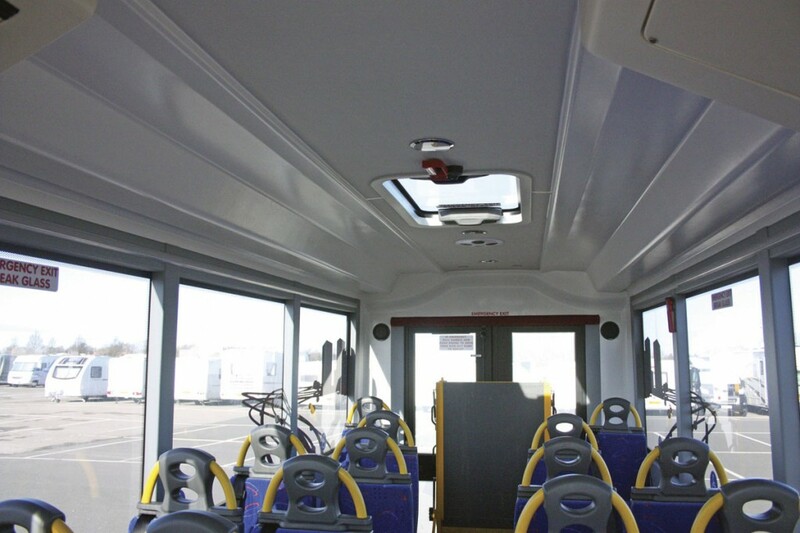 The interior of the vehicle is completely flat from front to back and the floor is trimmed in non-slip flooring and fitted with seat tracking for seat mounting and anchorage of wheelchairs. It is clad in one piece GRP mouldings. On the demonstrator, tracking for wheelchair seat belt attachment was also fitted at waist height and on the cant rail. The centre ceiling incorporates lighting and air diffusion units as well as a glazed opening roof light. Additional lighting is provided at the entrance and also at the rear for wheelchair loading. The demonstrator had space for 16 seats, in this instance Rescroft CT-Lite units with three point belts and NMI quick release fittings. A number of other seating types are available. At the rear the vehicle is fitted with two full height glazed doors which open fully to secure against the rear of the vehicle. Nu-Track offer two types of doors, wide, 1384mm as in the case of the demonstrator, or a narrower,1174mm, set can be specified. You can also specify the vehicle with a solid coach style rear end where rear loading of wheelchairs is not required. At the rear there is a fold out Portaramp which when combined with the lowered air suspension gives a very shallow ramp angle for loading wheelchairs. A choice of ramp styles are available. 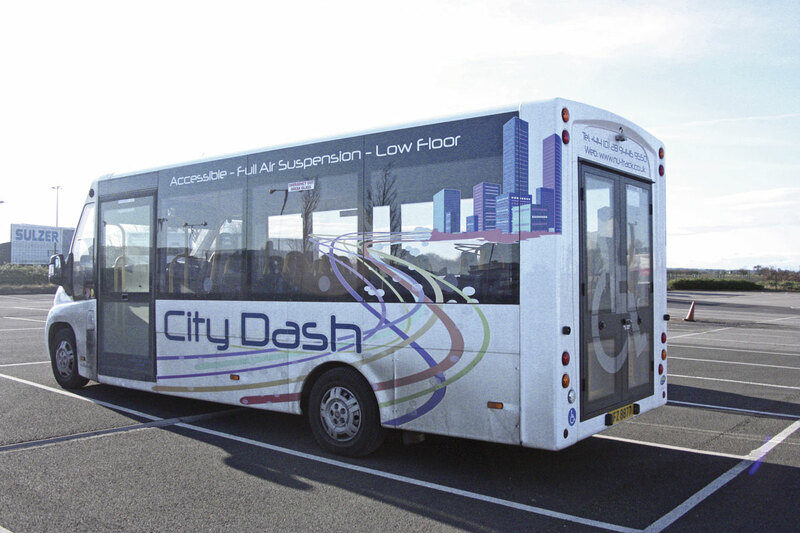 The City Dash has a maximum wheelchair capacity of four. 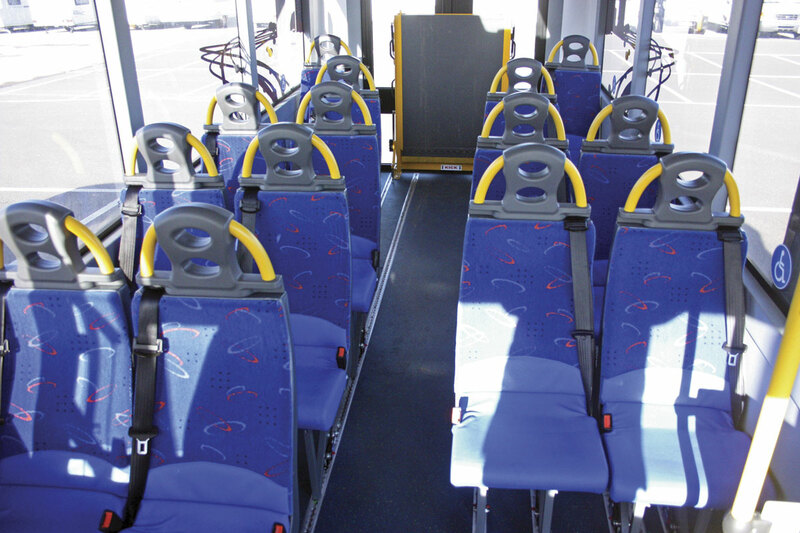 In that configuration it retains two seats for assistants or carers. The vehicle is fitted with large panoramic, bonded, tinted windows and although top sliders were not fitted on the demonstrator, they can be specified. It has an Eberspacher D5 heating system which is vented along the offside of the saloon. A Webasto system can be specified if required. At the front the vehicle has a large deep, tinted, laminated windscreen and large side windows with a sliding opening window on the driver’s side. The screen is fitted with a full width electric sun blind. The excellent Fiat Ducato rear view mirrors are retained as is their ability to be heated and adjusted electronically from the cab. 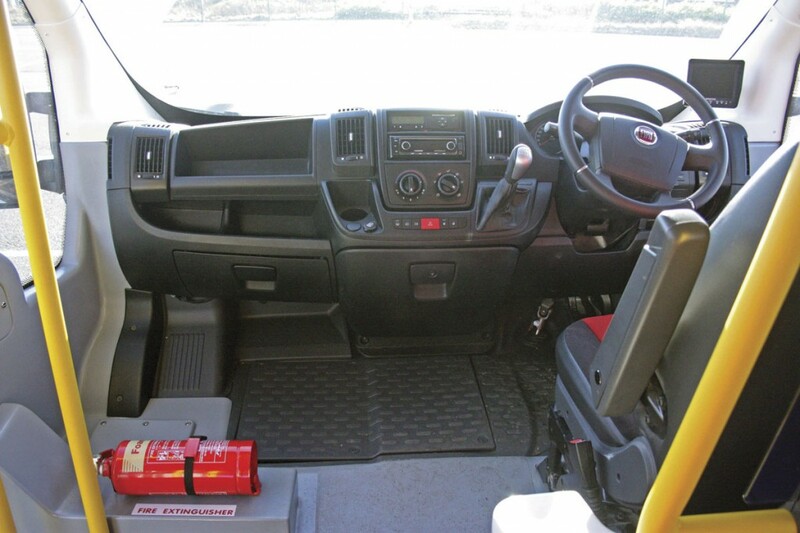 The cab area is basically Fiat Ducato and uses the standard dash and controls from that vehicle. Body system and heating/ventilation controls and the mirror adjustment control are mounted in a special unit to the driver’s right. On the demonstrator the control for operating the air suspension was mounted separately from the other switches but on future builds this will be incorporated into the body system control panel. 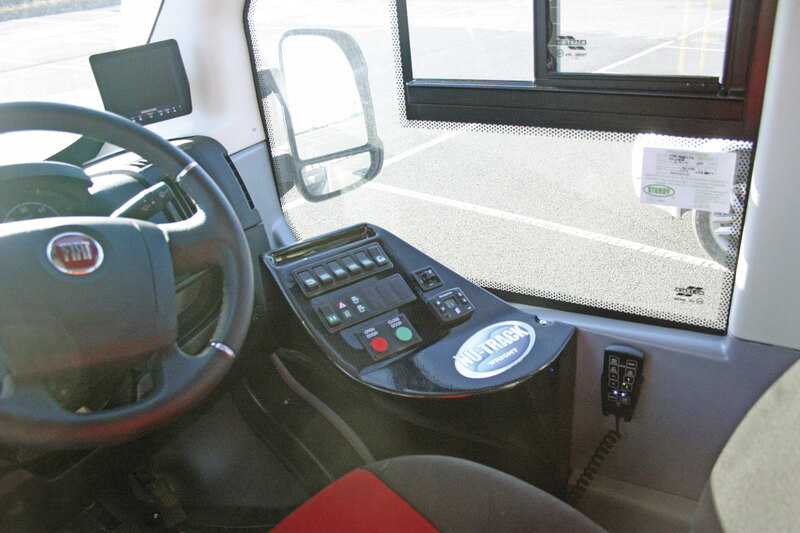 The screen for the reversing camera is mounted separately to the driver’s right and a radio/CD player is fitted but not a public address system though this is offered as an option. On the demonstrator, the area to the left of the driver has been left clear but this can be fitted with a luggage pen if required. Above the driver Nu-Track have incorporated two useful storage lockers. First impressions are always important when looking at a new vehicle and the City Dash doesn’t disappoint. The lines are clean and crisp. I particularly like the way that Nu-Track have blended the large windscreen and big side windows into the Ducato front end. Equally pleasing is the way they have then integrated that front end styling into the structure of the vehicle producing a cohesive design which is carried right through to the neatly styled rear end. Thom Bateman, Sales Manager at Nu-Track was very apologetic for the vehicle being a bit dirty despite his best efforts to get it cleaned before I saw it. A bit of road dirt doesn’t bother me, buses get dirty, especially during winter up in the North where it seems to have been raining since November. A little dirt can’t disguise the nice lines of the City Dash. To save Thom Bateman’s blushes this is what a clean Nu-Track City Dash looks like! I was equally impressed with the width of the entrance and the swift action of the Tamware plug door. Thom demonstrated the lowering air suspension and the step height achieved when it is fully lowered. Entering the vehicle I was struck at how light and airy it felt and by the quality of the one piece GRP trim moulding and the general fit and finish of the vehicle, an area where there has been a huge improvement in Nu-Track products compared with pre Wright Group days. I was also impressed with the gangway width that Nu-Track had managed to achieve on the City Dash although to some extent that is dependent on which seats you specify. Equally, the rear end and the large space provided for loading wheelchairs with the doors folding back securely against the rear of the vehicle is notable. With the suspension lowered the ramp angle achieved was very acceptable. Moving into the cab area I was struck immediately by the massive screen, the slim A posts and the large side windows. The dash area is unashamedly Ducato and there is nothing wrong with that because it is well planned with all instruments in easy view and all controls just where you expect them to be. Alongside the dash there is a separate panel which houses the body system controls. I particularly liked the easily identifiable door operating buttons, an area I think many builders and convertors don’t pay enough attention to. I did not like the positioning of the air suspension control which consists of a separate control pad on a wander lead mounted in a carrier to the right of the driver. I found it fiddly to use and was pleased to hear from Thom that it is to be relocated into the body system switch panel. That will be much better. Over the years I’ve driven lots of Fiat Ducato based vehicles and as readers will know I like it, especially when it has the 3.0 litre engine as in this case. This is an excellent engine with plenty of power and enormous torque which it delivers smoothly and quietly. The vehicle had the six speed automated ComfortMatic (Agile) transmission. I know some of you don’t like this transmission but I do. I have always found that if you just leave it alone to do its thing and don’t try to force it you can achieve very smooth transmission through the gears. You can of course always opt for the excellent alternative ZF six speed synchromesh manual box. It would be nice to think at some point the Ducato would receive the new eight speed Hi-Light automatic transmission used in the Iveco New Daily but I am not sure that will be possible. The Hi-Matic is longer than the ComfortMatic and fitting it into the front wheel drive layout of the Ducato may not be possible. Surprisingly the day of my City Dash appraisal turned out to be one of the only really nice days we’ve experienced in the North this winter. With blue skies and sunshine, I was glad of the full width sun blind! I was impressed as I drove the City Dash by the minimal blind spots and excellent all round front end vision. I was glad that Nu-Track had retained the Ducato rear view mirrors which are excellent. There were no squeaks or rattles from the trim and there was no shimmering of the body structure just a feeling of solidarity and tautness. The vehicle performed exactly as I expected with plenty of available power delivered quietly and smoothly. The ComfortMatic gearbox made easy work of moving smoothly through the gears. There was minimal dwell and no shuttling between gears which have been criticisms sometimes levelled at this transmission. Braking from the all- around disc system was smooth and straight with plenty in reserve. 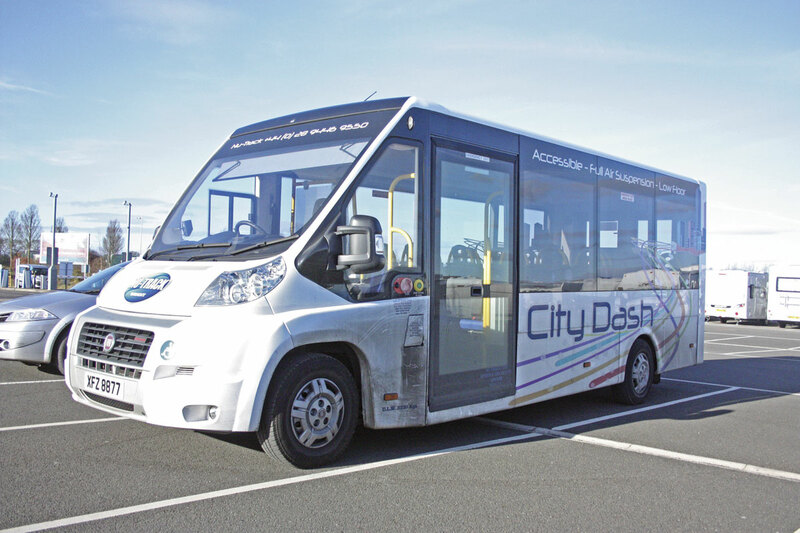 The City Dash is an impressive vehicle and I was not surprised to hear from Thom that it had already created a lot of interest. I’m sure we’ll be seeing plenty of them on the roads in the coming months. The vehicle I was driving was only the first in what is intended to be a range of vehicles. As I mentioned earlier Nu-Track are also offering a version with the Peugeot Boxer front end that will be very competitive. However, perhaps the most exciting development is that they are investigating the design of an electric version. No doubt they will be taking full advantage of the extensive work and experience that the Wright Group has of designing and building full electric vehicles. I’m already looking forward to getting my hands on it..